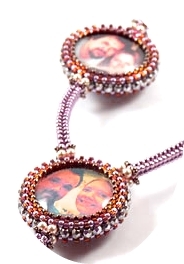 Use a combination of stitches to create this long fun necklace that encases pictures you love most. All components are reversible and customised using either personal pictures, magazines, or colourful paper. TECHNIQUES: Peyote, RAW, CRAW, herringbone and embellishments. Students must be very familiar with all of these stitch techniques. The tutor will also bring some beautiful scrap booking paper and lace as options. If you would like to encase some personal photos, Liisa can resize to suit and print for you. (Please send photos to workshop@beadsociety.com.au to be forwarded on to Liisa). Note, photos will not be forwarded until full payment has been made. Kits available on the day: Rose Gold; 24k gold; Silver and Bronze.